The small town of Necroville is quite literally a hell hole packed with zombies, vampires and werewolves. 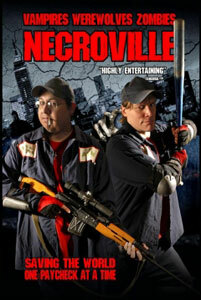 Our two heroes, Jack and Alex, get jobs working for Zom-B-Gone exterminating monsters for cash. Jack's bitchy girlfriend, Penny is a constant pain and things come to a head when she starts seeing her ex who also happens to be the master vampire. This is a low budget horror comedy which manages to drag out a few laughs amidst the bad make-up, woeful special effects and cringeworthy amateur acting. The ideas are better than the execution and despite a short running time it feels a lot longer. If you like whacky b-movies then Necroville is worth a watch.